State and local governments are now looking into tax payments into charitable contributions taxed by the federal government in the rollout of the tax overhaul. Scattered community efforts to help residents lessen the blow of the Republican tax overhaul?s limit on a popular deduction are turning into full-fledged rebellion in California and elsewhere across the country. Democratic politicians are pursuing creative ? and some say legally suspect ? maneuvers to help people circumvent a $10,000 cap on deductions for state and local taxes that took effect Jan. 1. In addition to considering a lawsuit to try to block the limit, elected officials are looking at ways to turn those state and local tax payments into charitable contributions that would be fully deductible or convert state income taxes into payroll taxes that would have the effect of giving people the benefit of the deduction. Republicans are already pushing back, raising the potential that Congress or the Internal Revenue Service could move to block the workarounds. The state and local tax deduction had been unlimited and the recent federal change, which is designed to generate billions of dollars a year in additional revenue to the U.S. Treasury, will be a big blow to many residents of California, New York and other states with high income and property taxes. The average state and local deduction taken by the 6.1 million California residents who filed for it in 2015 was $18,438, according to the Tax Policy Center. Only New York and Connecticut had a higher average deduction. Most of the states with significant numbers of residents who would be hit by the change are controlled by Democrats, which has led to accusations that Republicans targeted the deduction for political reasons. ?It is an economic civil war,? declared Democratic New York Gov. Andrew Cuomo in a speech last week. ?We must take dramatic action to save ourselves and preserve our state?s economy.? He?s not alone in seeking to blunt the deduction change. While New York is focusing on shifting its income taxes to an employer payroll tax, California state Senate leader Kevin de Leon, D-Los Angeles, has introduced a bill that would give residents a dollar-for-dollar charitable tax credit for state income tax payments into a new California Excellence Fund. Taxpayers would be able to deduct the contributions to the fund that would pay for state services on their federal returns. There were no limits on charitable deductions included in the GOP tax overhaul. ?I think all blue states around the country are going to do anything in their power to protect their taxpayers and try to bring them tax relief, whether it?s through innovative state tax policy or through legal action,? de Leon said Tuesday. ?I think that every option is on the table.? Three New Jersey communities are working in conjunction with Rep. Josh Gottheimer, D-N.J., to set up their own charitable funds to pay for police, schools and other services. Residents would pay into the funds and receive tax credits instead of paying property taxes. The state?s incoming governor, Democrat Phil Murphy, said last week that he wanted to ?aggressively? pursue such a plan on a state level. Connecticut Gov. Dannel Malloy also is exploring the state?s options for such changes, spokesman Leigh Appleby said. Dean Baker, co-director of the Center for Economic and Policy Research, a liberal-leaning Washington, D.C., think tank, has been advocating that states fight back against the Republican bill. ?The idea of having a state government game the federal income tax, as a general rule, rubs me the wrong way,? he said. ?Except I think this is really an extraordinary situation.? With Republicans, in his view, enacting the limit to hurt Democratic states, ?I think it?s perfectly reasonable for California and New York to say, ?Is there a way for us to get around this?? ? Baker said. 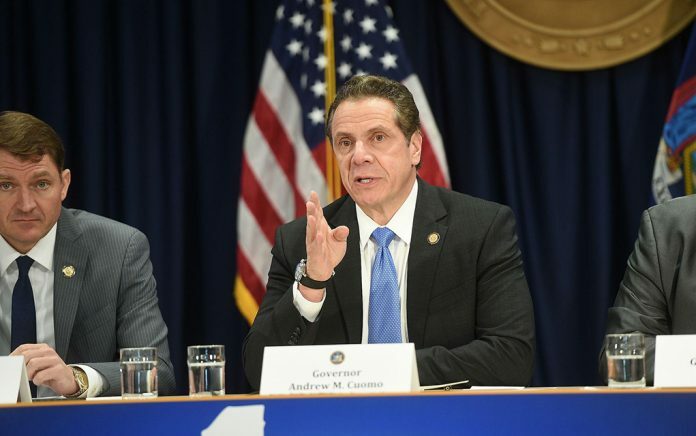 Cuomo said New York would go to court to challenge the deduction limit, arguing in part that it amounts to double taxation because some money used to pay state and local taxes is then taxed by the federal government. He vowed his state would ?lead the resistance to this injustice.? Rep. Kevin Brady, R-Texas, who helped write the tax bill that passed Congress with no Democratic support, said that some state and local officials are ?panicked? that ?the era of ?tax to the max? is over? because tax increases will be harder to enact now that some residents will be limited in how much they can claim as deductions. ?My belief is they would be better served, as public officials, in spending less time evading taxes and creating new loopholes in the tax system, and more time becoming more efficient and finding ways to lower taxes on those families and those workers,? Brady told reporters Monday. Gary Cohn, President Donald Trump?s top economic adviser, told Bloomberg TV last week that he understands that state and local officials are trying to help their taxpayers. But administration officials are going to have to evaluate any changes for their effect on the collection of federal taxes, he said. Federal officials stepped in last month after some communities moved to allow residents to prepay 2018 property taxes before the end of last year so they would avoid the new limit. The Internal Revenue Service said those payments would only be deductible if the taxes had already been assessed. An IRS spokesman had no comment Tuesday on the other changes being considered by state and local governments. The IRS already allows people to claim contributions for payments to more than 100 charitable programs in 33 states. Some of them fund state-supported activities such as public schools and college scholarship programs, said Kirk Stark, a University of California, Los Angeles law professor who has studied the issue. He and seven other tax experts released a 44-page paper Monday arguing that states would be allowed to turn tax payments into charitable contributions. ?There?s nothing new here,? Stark said. ?It?s just an attempt to fit it into what the IRS and the courts have consistently blessed over the decades.? But Jared Walczak, a senior policy analyst at the conservative-leaning Tax Foundation, predicted the IRS would balk at a large-scale plan designed to circumvent the deduction cap. ?There is a difference between a few people perhaps gaining something and the IRS turning a blind eye to an entire state of taxpayers misusing the charitable deduction,? he said. ?There?s no actual charitable benefit. The only benefit is to the taxpayer.? The strategy of converting state income taxes into an employer payroll tax had a better chance of passing legal muster, although the IRS still could determine that it was ?little more than a shell game,? Walczak said. The IRS allows companies to deduct taxes directly from a worker?s payroll, such as for contributions to unemployment insurance. To circumvent the cap on state and local deductions, a state could turn its income tax into a payroll tax. Instead of paying a worker $100 in a state with a 5 percent income tax, an employer would pay the worker $95 and send the state $5 in a payroll tax. The worker would end up with the same after-tax pay, but the change would have the effect of keeping a full state income tax deduction because only the $95 would be taxed by the federal government. Experts said it would be complicated to put such a plan in place, and workers would have to be sold on the idea that the decrease in their wages is actually to their benefit. Also, some employers might not be able to reduce wages for some workers, such as those under union contracts, even if there?s a tax benefit to the workers.